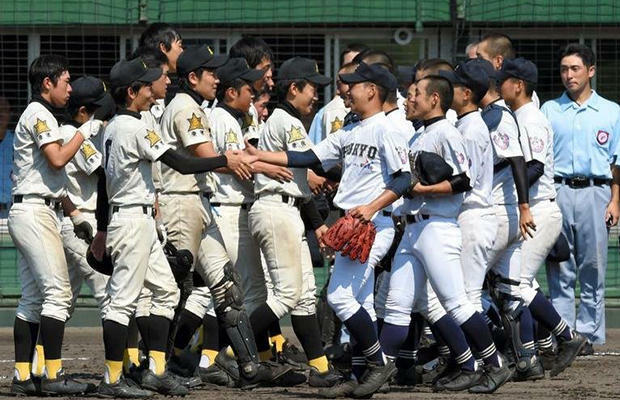 In a pitching duel to end all pitching duels, Chukyo High School and Sotoku High School were held scoreless for days — literally — during a semifinal matchup at the 59th National High School Rubber Baseball Tournament in Japan. It wasn’t until the 50th inning — four days after the game had started — that Chukyo finally broke through for three runs. Fortunately for them, and pretty much everyone involved, that would hold up, allowing them to advance to the finals later on Sunday. Amazingly and ridiculously, both starting pitchers went the distance during the marathon. Chukyo starting pitcher Taiga Matsui threw 709 pitches and allowed 26 hits over his 50 innings. His counterpart, Jukiya Ishioka of Sotoku, totaled 689 pitches and allowed 22 hits. We appreciate the competitive spirit, but we’ll politely disagree that throwing nearly 700 pitches over four days is a good experience. It’s excessive and irresponsible for coaches to sign off on such usage, even though Ishioka admits volunteering to continue on. And really, it’s questionable that the game was allowed to continue on as it did, although at least it was broken up into 15 innings per day. The Asahi Shimbum reports that had the game remained tied after 54 innings, the winner would have been decided in a drawing, with the reward being to play in the championship game just hours later. Why 54 innings is anybody’s guess, but that’s a lot of effort to have the game basically decided on a coin flip. Perhaps a pitch count would be a better way to help determine a winner without having to run the young pitchers into the ground. It would allow some other kids to get some experience as well, which is never a bad thing. It’s also reported Chukyo went on to win the championship 2-0 over Miura Gakuen High School. They used a different pitcher to start the game, but Matsui was called on to throw 77 pitches in relief, bringing his two-game and four-day total to 786. This entry was posted on 火曜日, 9月 2nd, 2014 at 11:17 AM and is filed under Japanese Test. You can follow any responses to this entry through the RSS 2.0 feed. You can leave a response, or trackback from your own site.